Experience the intimacy and beauty of singing in a choir! 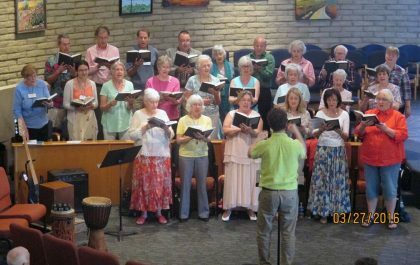 Our Congregation Choir rehearses every Wednesday evening, 7:00-9:00pm, from September through May, and sings at two Sunday services each month. All ages are welcome, and childcare is available during rehearsals. The ability to read music at an elementary level is helpful but not required. The choir is led by music director Benjie Messer and accompanied by pianist Mary Cota. Do you play an instrument? Most of the music in our services is provided by members of the congregation, in styles from folk and classical to jazz and pop. 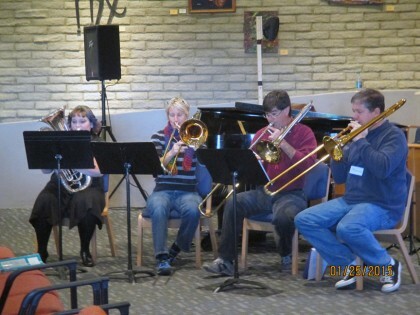 Several musical groups prepare music for worship on a regular basis, including a string ensemble (Open Strings), a jazz combo, a vocal trio (ReSisters), and a constellation of musicians who play country, folk, rock and blues. Several times each year, Benjie coordinates a chamber orchestra of strings, winds and percussion. Has your ukulele (or related instrument) been staying home? Bring it to meet its soulmates at UUCP! Our informal, all-ages strumming and singing circle gathers during coffee hour to sing and play favorite songs. This is a lighthearted way to connect with each other musically. Guitars, fiddle, mandolin, harmonica, singers, hummers, and clappers join us as well. Beginner ukulele instruction can be arranged. Talk to Carolyn Allenby to receive email updates on meeting dates and places. Want to use our sound and video equipment to support worship services? Audio/Visual Technicians need to have excellent hearing and the ability to walk up and down stairs. Previous experience with A/V equipment and production is helpful but not required. 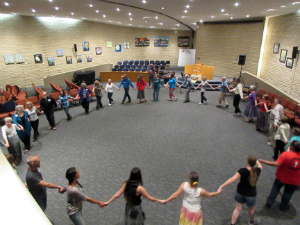 Keep your ears open for other musical events throughout the year- evening song circles, community dances, no-talent talent shows, concerts by guest artists, singing meditation workshops and more! For more information about any of the activities above, contact our Music Director, Benjie Messer, through the form below.